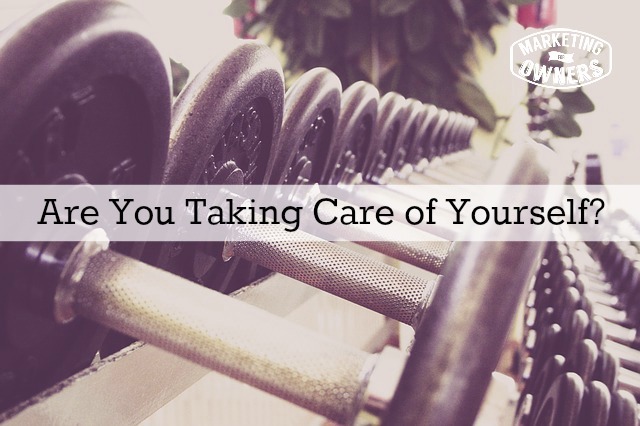 Are you looking after yourself? What I mean by that is there is more to life than work. Some of us owners work and then we do some more work and then we go home and we do stuff that we don’t think is work but anyone else would consider as work. When you sit in front of the TV and you put a laptop board on your lap or grab an iPad while you watching the TV and you just do a bit of work then I have a definition for that. What I would say is, if you ask any of your staff to do the same task at their home in their spare time, in their evening and they ask how much they’re going to be paid, then that’s work. Okay? Remember that. So we work all day. We got off from work on weekends. But we need to take care of ourselves and there are reasons for that. Having a fit and healthy body, having a fit healthy mind is good for business. It also prolongs your life and you may have a family. They like to see you every now and again. And I fell for this trick a long long time ago. I worked and I worked and I worked and I said to myself, if I build this up, then I will have more time to spend with my family. But that wasn’t going to happen. So I made a decision, family first and spend the time with them. When my kids were born, I was there. When they started school, I was able to drive them to school. But it’s more than that, its overall fitness. A lot of us don’t take time for exercise. Put it into your schedule. You have appointments. You have meetings. Why not schedule or make an appointment for the fitness. It can be a stroll, it can be a walk, it can be a workout. Personally, I am on week four of insanity at the moment. So I get up in the morning and I sit down and I take a break for ten minutes and sort of clear my mind and then I do some insanity workout before it’s too late to change my mind. And trust me, I don’t like it, but I forced myself to do it. I have done it before and after it, you kind of feel better. That time you don’t because you’re exhausted lying on the floor. However a while later I found that I have more energy in the day and that I just felt better. It’s kind of odd cause I haven’t realized it while I was doing it. It’s only after I finished when I had made myself more fit. Then I realize I have more energy. What about eating? Are you making time for eating? if you are like me, if you ever done the thing where you cant put the kettle on , go back to a bit of work, kettle is boiled, cool down, go put the kettle on, go back to a bit of work while it was boiling, kettle boils, cools down, go back etc. Do that like 10 times before you actually have the cup of tea or cup of coffee. Take the time out. And then family. Dedicate some time. Schedule it in your day, schedule a free day. Dan Sullivan has buffer days, has focus days and he has free days in the coaching program. He’s a strategic coach. Make sure you find time for family. Take a whole day off. Remember when your kids grow up and they look back and someone’s talking to them. What will they say when someone asks them — “What do you remember about your childhood?” They say, “Oh yeah, I used to have all my friends over, Dad’s sitting there with his laptop, working. Mom was always on school events, on her iPhone though. But yeah, she was always there.” Is that the kind of memory you want your kids to have? Or do you want your kids to remember mom and dad focused on them. Just a thought. But take time to look after yourself and everything else will fall into place. You do have the time. Okay? When you want to go to the bathroom, you get up, you go, you make time. Don’t make excuses. Make time for yourself, for your health and for your future. 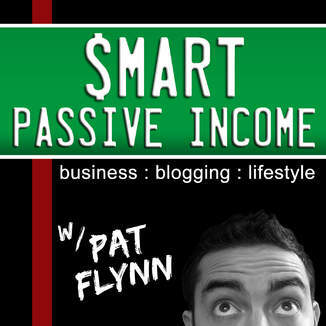 Today’s recommendation is one of the best out there and it is Pat Flynn, from Smart Passive Income. Now how do I explain Pat Flynn? First of all, it’s one of the most popular podcast in the whole of iTunes on business. He learns how to do stuff in the business and then he applies it. The great thing with Pat is he is very humble. He admits his mistake so he is brilliant on online business, but he gets guests and they explain how something needs to be done. And he will point out the things that he’s not doing, that he is doing wrong and he will then apply some of those new things that he learned from that interview. The Smart Passive Income is weekly, 40 minutes, an hour interviews. Someone good, generally, you will learn something every single time. His blog is at smartpassiveincome.com. By the way, one of the great things about Pat is one of these publishes all his earnings, publishes all his expenses. You can see he is genuinely working. Go listen to Pat.